Farmhouse Urbania-Farmhouse La Rosa Tea in Urbania in the Province of Pesaro and Urbino. 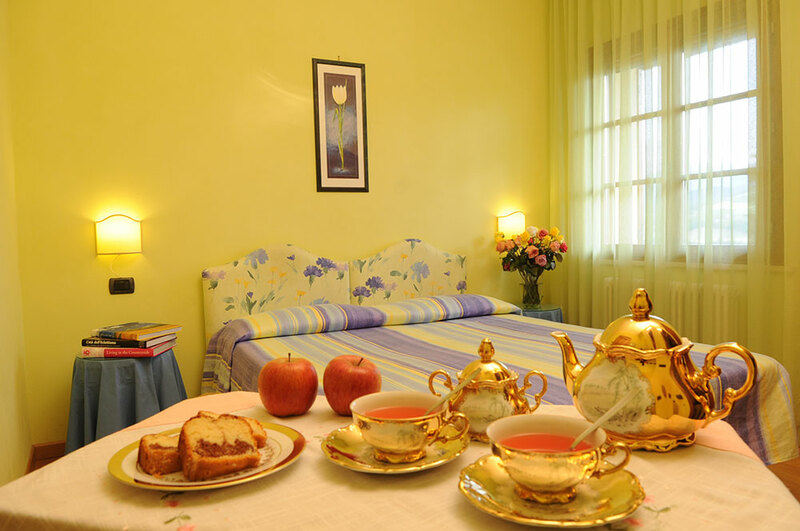 In the area around Urbino, in the province of Pesaro and Urbino, the farmhouse La Rosa Tea can be discovered perched on a hill only two kilometres from Urbania, once known as Casteldurante. 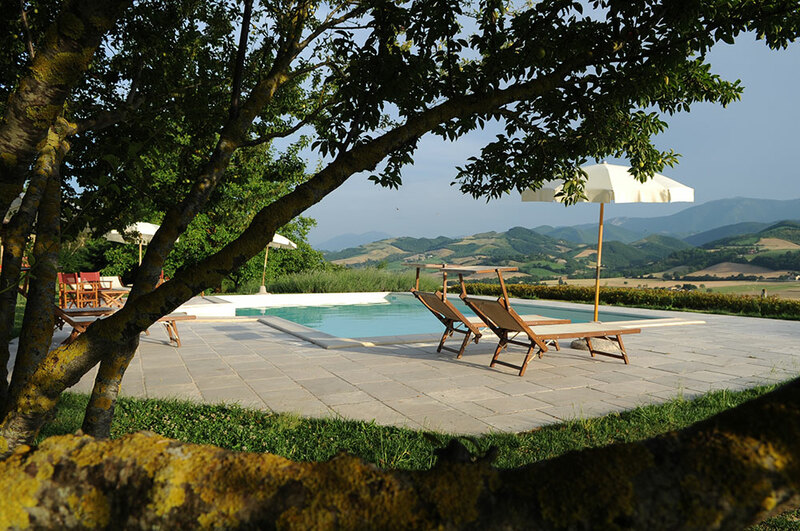 In this farmhouse of Urbania one can totally relax in one of the seven tastefully decorated bedrooms with en suite bathrooms, or take a dip in the swimming pool surrounded by the peace and quiet of the countryside. 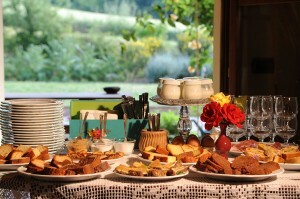 Breakfast can be enjoyed in the converted stables which also serve as a library and comfortable lounge . On chillier days logs from the surrounding woods are burnt in the large fireplace creating a special atmosphere. The owners Stefania and Roberto will welcome you and always have time to talk about the local area including its wildlife and to make suggestions as what to visit in order to make your stay really enjoyable. Among the farmhouses of Urbania it is one of the very few where one has the fortune to look out of the window over the valley of the River Metauro, once scene in 207 a.C to the defeat in battle of the general Asdrubale, and the Appenine chain including Monte Nerone, called Lirone by the last Duke of Urbino, Francesco Maria II della Rovereto. History is forever present in this richest of areas. The farmhouse Rosa Tea feels the presence of the great Renaissance artists. It is situated near the antique Pieve di Monte San Pedro where the famous architect Donato Bramante was baptised who became sponsor to Raffaello Sanzio in Rome under Pope Giulio II. 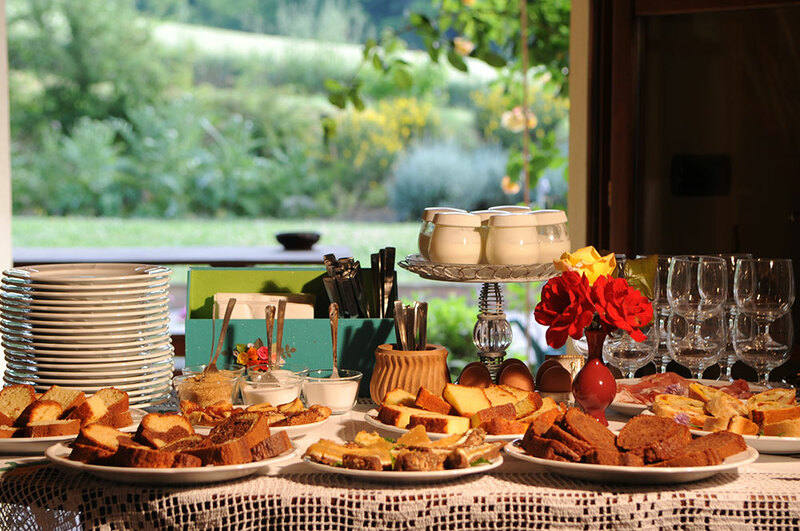 Prices and offers of Farmhouse La Rosa Tea include a rich homemade breakfast.